There is no better season for these kinds of songs than the autumn, when the promises of summer have abated and the nights of reckoning grow longer. L.A. Witch seized the moment by revisiting a handful of their early long lost tracks and reshaping them into Octubre, a five-song EP that delves deeper into their darker side. Opener and lead single “Haunting” is a swaggering rumination on heroin, full of big ringing chords, swirling tremolo, and narcotic vocals. It’s more densely layered than anything the band have done in the past, owing in part to the engineering skills of Samuel Shea (Warbly Jets) and the production savvy of Gregg Foreman (Cat Power, Delta 72), but also as a result of the band’s premeditated deviation from bare bones recordings. “Because these are old songs—we don’t play them live anymore but still wanted them to be heard—this was the perfect opportunity to get experimental with sounds and textures,” Sanchez says of the EP. 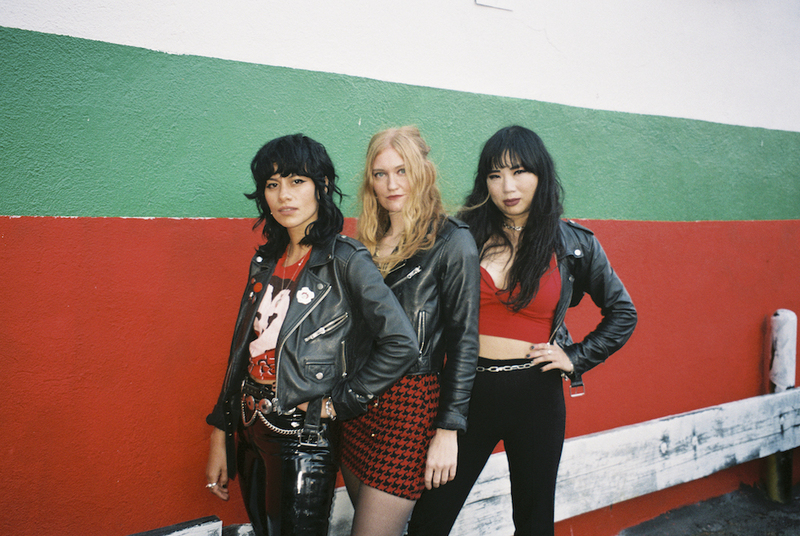 Despite this new studio adventurism, the songs on Octubre stay true to L.A. Witch’s vintage starkness. The obsessive love song “Sleep” still centers on the trio’s economic interplay, but the empty spaces between reverberating chords are filled with woozy whammy-barred guitar, as if tape bleed-through caught the ghost of some forgotten troubadour. The cryptic “BB’s Momma” gets bolstered by organ vibrato in its sultry verses and bombarded by bloody-knuckled piano in its climactic choruses. As the EP culminates with the acoustic ballad “Heart of Darkness” and the instrumental “Outro”, we hear echoes and melodic ether swell in the background, as if the magic conjured by L.A. Witch is beginning to take on a life of its own.